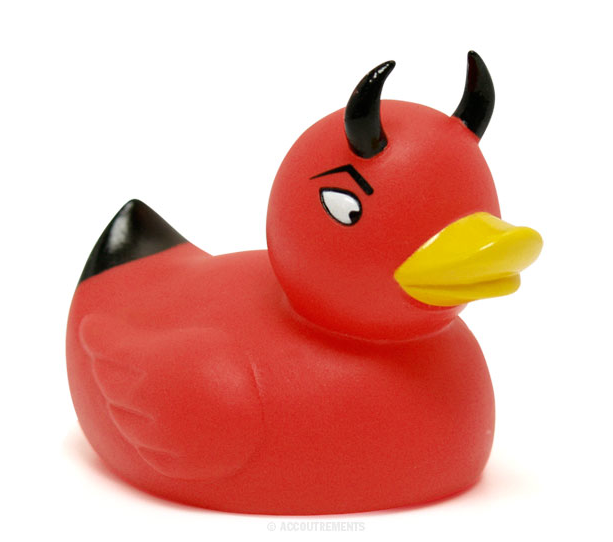 Do Stacy McDonald and Kelly Crawford Pass the Duck Test on Patriarchy? HA note: The following is reprinted with permission from Julie Anne Smith’s blog Spiritual Sounding Board. It was originally published on May 8, 2014 and has been slightly modified for HA. Suppose you see a bird walking around in a farm yard. This bird has no label that says ‘duck’. But the bird certainly looks like a duck. Also, he goes to the pond and you notice that he swims like a duck. Then he opens his beak and quacks like a duck. Well, by this time you have probably reached the conclusion that the bird is a duck, whether he’s wearing a label or not. Not long after I posted the article “Queen Bees of Homeschooling Stacy McDonald and Kelly Crawford Don’t Like the “Victim” Word in the Lourdes Torres-Manteufel vs. Doug Phillips Lawsuit,” there was some fallout, most likely related to the pushback they received here. 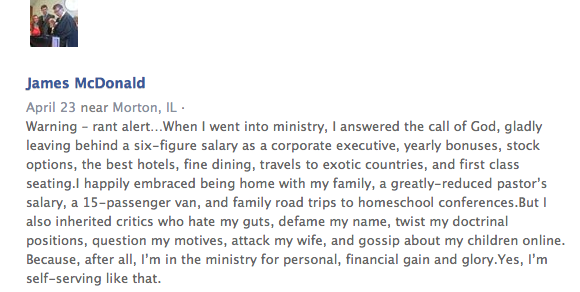 It’s always interesting to watch the responses to blog articles where we are exposing truth. We typically see back-peddling, web scrubbing, but rarely an admission of wrong teaching, etc. I think it’s important to document what happened so that people can see for themselves and discern. Do the behaviors match the message? What is the fruit that we see? Is this the kind of teaching we want to stand behind and pay good money to hear at conferences? Do we want these foundational teachings to influence our families for decades? 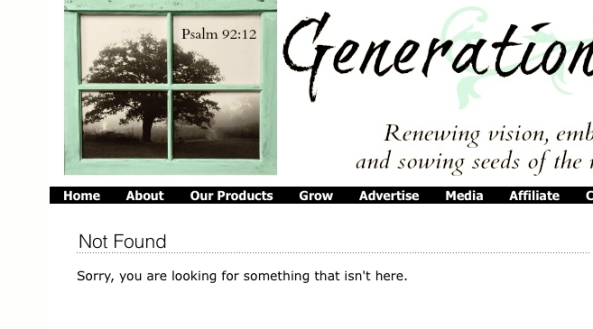 The “Tenants of Biblical Patriarchy” has been long scrubbed from the Vision Forum website, but here is the cached copy. I guess I’ll be rehashing the same topics with new names until I die, but they won’t let me go. There is something I’m so tired of. The word “patriarchy” is practically synonymous with an explicative in this culture. I’m tired of that. Patriarchy is not a new concept, but one as old as the world itself. It is biblical and if you don’t like it, and you’re a Christian, perhaps a new religion would suit you better. So, did Kelly Crawford change her views on Patriarchy? She said she would rehash the same topics until she dies. Why would she remove that article from 2008? What is she trying to hide? 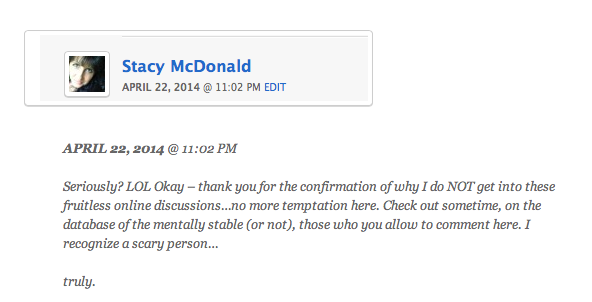 Yes, Stacy McDonald, publicly made a low blow about the mental stability of one of my commenters. Did you notice the 6-years-of-silence part? Although Crawford doesn’t mention the silence, it’s important to the whole story. Obviously this hit a nerve for Crawford and is not something to be dismissed lightly. Imagine Taunya’s surprise in receiving such an e-mail after so many years of silence. Let me put in my own words my interpretation of what Crawford is saying: This information I am sending you is so important that I am breaking 6 years of silence to send it to you. Listen to me! If you don’t believe the way Stacy and I believe, you’re one of those bad-fruit people. Furthermore it is not “God’s will” for adult daughters to live in the homes of their fathers until marriage. There is nothing biblically wrong with young women attending college, working or living on their own. This is wrong and any woman falling for this as “God’s Word” is deceived. These are cult-like teachings must like the idea that women need to wear skirts and dresses for the sake of modesty or that it is wrong to limit the number of children one has. The definition of priest says it all Kelly! No women needs a priest! A man goes directly to God through Jesus and a woman does as well. She does not need her husband to be her mediator nor does she need him to be her prophet. She can read Scripture and the Holy Spirit resides in her just as He does her husband, no need for a husband to be her prophet! And KING? Wasn’t that addressed in the Old Testament. None of us need a king, we have that in Christ. Doesn’t that 6-year silence also say a lot? It reminds me of junior high. “I’m not going to be your friend if you don’t like Suzy Q.” Do you see what this is? It’s my-way-or-the-highway mentality. You have to go along with my beliefs in order to be part of my group. It creates an us vs. them mentality. You are either in, or your are out. On the same day, April 23, Stacy posted a note on her Facebook wall endorsing her husband’s article, “The ‘P’ Word,” which is about Patriarchy. Her husband, in his article on Patriarchy discusses words and their meanings and how sometimes the meanings change. He tries to paint a beautiful picture of Patriarchy. But check this out, is she really saying she is going to have to disguise that P (patriarchy) word from her vocabulary? Stacy McDonald: All that being said, I personally believe that, for the sake of clarity, and knowing that the word has been so ravaged in the eyes of so many, it’s best to not to use the word. Because the term is not as important as the principle. “A rose by any other name would smell as sweet.” Biblical order is important, but we don’t have to use a word that provokes people or causes them to misunderstand us. Ok, so let’s just act like that word doesn’t exist. Is that what she’s saying? We’re going to continue doing the talk, and walking the walk, but we’re just not going to let anyone know what we’re really doing is Patriarchy. Folks, the above patterns are the rotten fruit. It’s rotten fruit in attempt to defend more stinking, rotten fruit: Patriarchy.Stacy and Kelly have been promoting “Biblical Patriarchy” for years. Now Stacy wants to quack about it, without using the P word. It’s time to call this heretical teaching out now. It is destroying families. It is keeping young ladies held captive in their own homes, not giving them choices to further their education, to be critical thinkers, to use the creative minds God created for them. Removing blog articles and not saying the P word is not going to change the fact that Patriarchy = Duck. It’s rotten fruit in attempt to defend more stinking, rotten fruit: Patriarchy.Stacy and Kelly have been promoting “Biblical Patriarchy” for years. Now Stacy wants to quack about it, without using the P word. But ChEKA, OGPU, NKVD, or KGB, the mass graves in GULAG still keep filling up. Reblogged this on House of Water. Honestly, the titles of her articles really say everything. I should have known better than to think I would get anywhere.